Few prospects on the defensive side of the ball will have a real chance to stand out among the competition in the months leading up to the 2017 NFL Draft – simply because of the overwhelming depth that this class has all over that side of the ball. The Senior talents in this 2017 class will get their opportunity to show themselves in front of scouts and NFL coaches alike this weekend at the Senior Bowl though, and plenty have a legitimate shot to fly up draft boards with their play and composure. 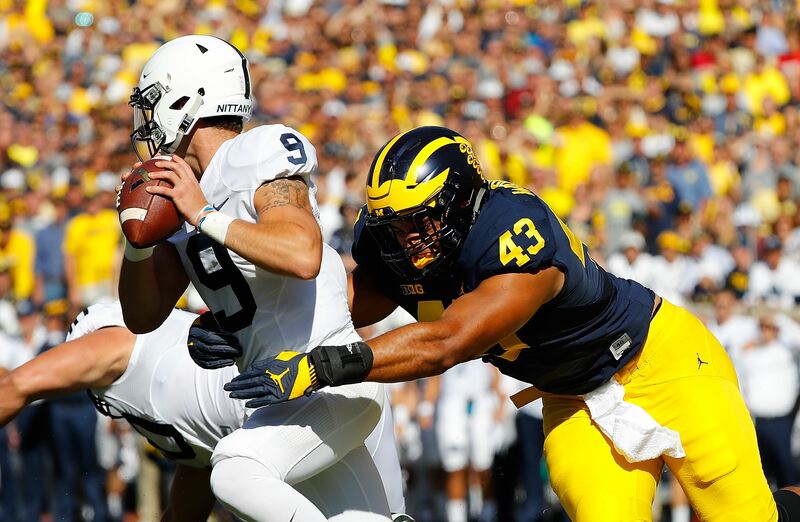 With 12 sacks in his final two seasons at Michigan, Chris Wormley will have a tremendous opportunity to improve his stock as a valuable EDGE talent looking to separate himself on any team’s stack at EDGE – as they’ll have plenty of talented pass rushers to grade this spring. There is a lot to like about Wormley’s game, and equally as much to seek improvement with. Here is his full scouting report. While not nearly on the same level as a complete defensive end, Wormley’s college film reminds me a lot of Joey Bosa’s from a season ago. Rarely making the flashy plays, Wormley finds ways to make an impact with often overwhelming strength and consistent power off the line of scrimmage. Ideally, Chris Wormley will find ways to rush offensive tackles down the middle a lot less as he progresses, but for now he can still overpower them – as he does in the clip above to capture the edge and finish with his strong hands. As impressive as Wormley’s build and lower body strength is, his strong hands are by far his best trait. Evaluating defensive linemen can often be as simple as, “do they knock back their blockers at the point of attack”, and this answer for Wormley is most-always a definitive yes. With the ability to work against guards as a pass rusher and line up on the interior to stuff the run as well, Wormley has added value thanks to his versatility and sound tackling ability in addition to his workable and natural edge ability. At the defensive end position, Wormley is ideally a strong side player in the NFL, as he’ll be a formidable run stopper with enough pass rushing ability and sense to remain on the field on passing downs. 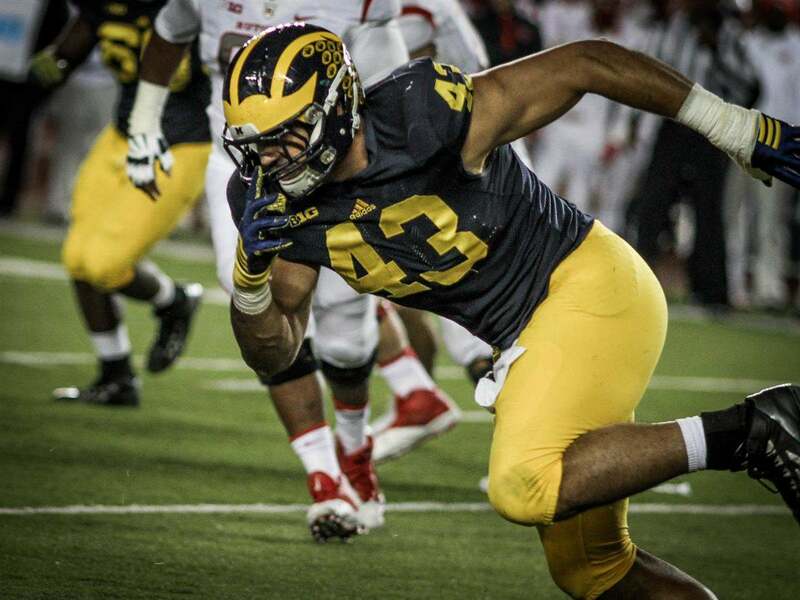 There is a scenario for Wormley at the NFL level where he fails to progress as a polished pass rusher, never developing the counter moves that would make him a first round talent in this draft if displayed at Michigan. Rushing tackles right down the middle is a hard way to be effective in the highest level of football, and Chris Wormley also does not show ideal bend to deal with this in any way that’s not just a projection for the next level. Rarely an issue because of his strength and awareness, Wormley’s pad height is often times too high, which takes him out of pass rushing situations early in downs. Because of this pad height, Wormley rarely gets to convert his power to the core strength that allowed him to capture the edge and make a difference at defensive end with the Michigan Wolverines. It would be unfair to say that Wormley never won using some speed around the corner, but this speed to close on the quarterback almost always came as a result of his power pushing blockers up the field and out of position to seal him. Wormley’s ability to change directions is also limited by this below average speed, which scouts are going to have to expect to improve if they want to make a serious case for him to earn a high overall grade. I’ll bring the Joey Bosa comparison to back to summarize Wormley not because I expect him to be ranked nearly as high on draft boards across the league, but because the consensus on amateur scouts like myself when it came to Bosa in 2016 was that he wouldn’t be a difference maker in the NFL. Chris Wormley’s college tape doesn’t scream “difference maker” at the next level, but with a high motor and some incredible pro-level traits to work with, it was good enough to earn a second round grade on my 2017 NFL Draft board. I would feel comfortable playing Wormley in any situation with any personnel in the NFL, ideally as a LDE to hold up at the point of attack without a question. Capable of playing down the line at RDE as well as inside at DT too, Wormley’s versatility is also a huge part of his second round grade – showing quality rushes at all three of these positions playing multiple techniques. While his name likely won’t get called on the first night of the 2017 NFL Draft, the fan base that lands DE Chris Wormley in the following days should be very excited about the value and upside they’ll find with this physical and gifted player.